Good news! 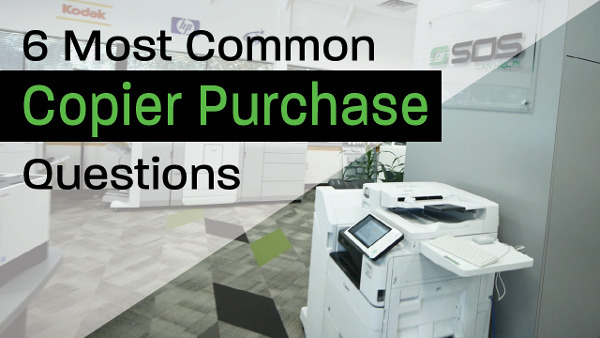 This blog was updated for 2019 - How much does it cost to lease a copier in 2019? Searching for, "how much does a copier cost" is reasonable - it's certainly the #1 question from our customers. You'd think it would be a no-brainer to include the price of a product or service that you are purchasing, and if you are like most people, you assume that not offering a price means the company is trying to hide the cost for fear of scaring you away. The truth is that it is more complicated than that - but don't worry, we're going to give you all of the pricing information you need to make an informed decision. When you go online to look at the price of a car, you can choose to go directly to the manufacturer (in some states) or a dealer; but when shopping for a car, it seems that each model has no one set price. We of course know that the reason for this is because no two cars are alike. Assuming you are comparing the same make, model, and year, you have other factors to consider: leather vs. cloth, automatic vs. manual, sunroof vs. standard, GPS vs. no GPS. On top of that, if you decide to go pre-owned, you have to consider mileage and wear-n-tear, and very few cars - if any - can be found with everything exactly the same. But what if I don't want or need GPS because I have a smartphone, or the sunroof just makes me constantly have to wear sunglasses? Perhaps my budget only allows for cloth interior, and even though it's nice to have these extra luxuries, they aren't essential to all buyers. On the flip side of that, someone who doesn't know how to drive a manual transmission may consider having an automatic a must, regardless of budget. This is a similar decision you must make when selecting a copier. I'm happy to say that by the end of this article, you will know what to expect when purchasing or leasing your future copier. Purchased out right, a full-size copier for an office can run you between $2,500 to over $60,000 depending on the copier and features you choose. That’s a range of $57,500! You might be asking: how in the world could a copier have a range that wide? The truth is that your needs will determine your price, and even though you may not have known it before, copiers have changed a lot through the decades and do much more than simply make copies. Hardware/Model: This is the basic nuts and bolts of your copier – the engine, if you will. It's also the most important consideration when deciding which is right for you. Among the factors to consider are volume (average copies needed daily), peaks in volume (is there a period where you need to pump out a lot of copies compared to others – like the end of the month? ), add-ons, and black and white versus color. Service ($0.01-$0.10 per page): The price of service will vary the most from dealer to dealer, and the quality of service will also vary by that margin, as well. Service pricing, however, is relatively consistent in the industry when factoring machine efficiency. For instance, if a copier can be leased over a period for $160 per month, and a larger machine can be leased for $270 per month, you would be inclined to think that you should go with the smaller machine that costs less (if either one could meet your needs). This makes sense, except when you include the fact that smaller machines are typically less efficient than their big brothers, and therefore have higher service costs associated with them. The same $150 machine, that appears to be the better deal, now has a significantly higher price per month than the larger machine. Sometimes, the difference can be several hundred dollars per month –eliminating the amount saved on the cheaper machine. This is consistent with dealers and manufacturers and makes sense, because you are paying for more service on the less efficient machine. Older, used machines can also have higher service costs because it is more expensive to maintain them due to older parts that need more attention and replacing. This doesn't mean used machines can't be a great value! Just make sure you understand how many copies have been made on that used machine and if it matches the monthly volume its spec sheet recommends. Remember: a used car that's two years old with 100,000 miles on it may not be as good of a value than a five-year-old car with 60,000 miles on it. Financing: The final and simplest factor is financing. For most, the choice is a shorter, more expensive lease (usually utilized for the ability to upgrade technology, regularly), or a longer and cheaper lease. This of course will change your monthly payment to the dealer or manufacturer, but is standard across the industry. At this point, you have a better idea of how dealers and manufacturers get their pricing and you understand how they arrive at the price that they ultimately quote. Still, the bottom line might seem daunting to you and your budget, even though the need is something that can’t be ignored. You might be thinking that you will go the cartridge-based, multi-function printer route by purchasing a small fleet of them at a local retail store (with quality options running in the $700 range). On the front end, this is certainly a cheaper option, but it does not take long to realize the costs can pile up on you. If you have ever looked at the box of an ink cartridge, you have probably noticed that they all have a range on them. The range will be something like: 3,000 pages printed at 5% coverage - with "coverage" meaning the percentage of the page that is covered with ink. An $80 cartridge doesn’t seem like such a bad deal at this point! But what does 5% coverage get you? Standard Office Systems did a study on this, and the image below illustrates the various percentages. 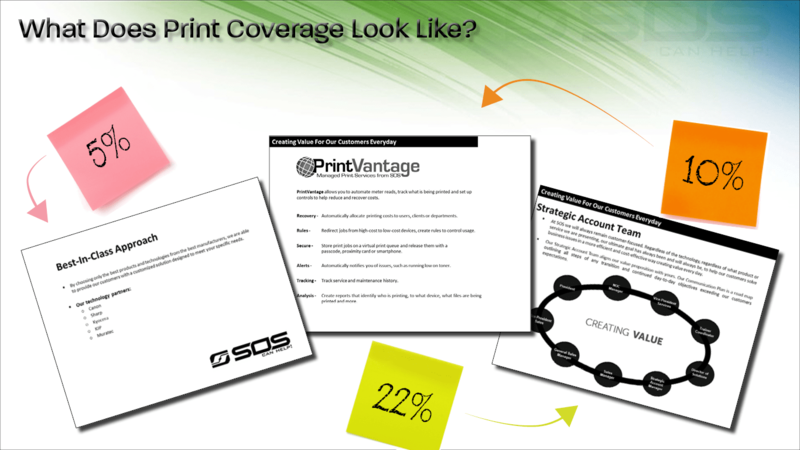 As you can see, we use over 5%-page coverage in many different situations, with color being capable of over 100% coverage due to the many layers often required! Quite often, we print documents that are easily over 5%, and suddenly we are much higher in cost. Remember, the laser or inkjet printer will also be substantially slower. When compared to a stand-alone full-service copier, you need more than one of the smaller units to ensure that your employees aren't standing around a single machine waiting in line for their work to print. The only practical reason anyone would choose this option is if their volume of printing and employee usage was low enough to justify less regular cartridge replacements, or less printers. If that is the case, then a stand-alone copier will not be a good fit for your business and you may save money going the retail store route. Just make sure to have a back-up if you need to send it back to the manufacturer for service, so you can avoid costly downtime. RELATED: How Do I Get Out of My Copier Lease? At the end of the day, you are spending thousands of dollars to get a machine with the goal of getting the job done for you and your business. Standard Office Systems helps businesses get the most value from their copiers every day. Be wary of making shortcuts just to save a buck here and there. Remember, there is a reason why mainstream media has made a great living out of making the frustration of dealing with cheap copiers comedic gold (i.e. Office Space). 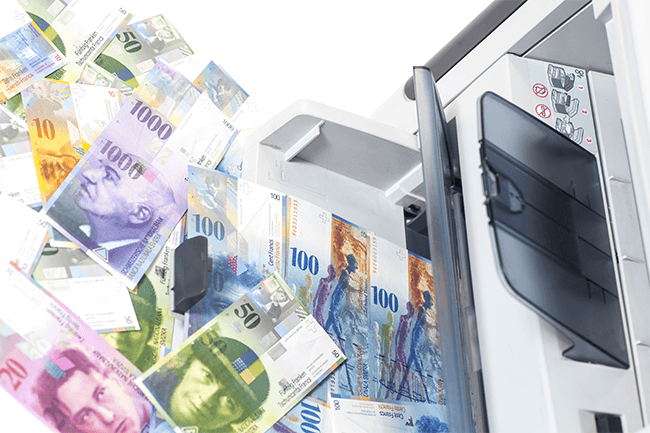 How Much Does A Printer Really Cost?